Salesforce donor management software is completely customizable. This means that once it's set up according to your nonprofit's needs, the result is a software solution designed specifically for your organization. With a solution that meets your specific needs, you'll find that you manage data more effectively, build relationships with donors, lead more compelling campaigns, and grow as an organization. Store the most important data. Leverage your CRM to reach your supporters. Use your CRM to manage all of your engagement opportunities. Integrate with a fully equipped fundraising toolbox. There are over 30,000 nonprofits that currently leverage their Salesforce donor management software to power their organization. Make sure your organization is ready to make the most of your CRM. Let's dive in to learn more! 1. Store the best data in your Salesforce donor management solution. The whole purpose of investing in your CRM is to achieve better management of your donor information. That's likely why you invested in Salesforce to begin with. So why wouldn't you check to make sure you're storing the right information? Defining the data you store in your CRM is especially important when nonprofits use Salesforce. Salesforce charges organizations like yours when you reach certain storage capacities. Therefore, you should ensure you're storing actionable data while limiting additional information storage to save space. For the purposes of this article, we'll divide data into two major categories: individual profile data and data averages. Information stored in the personal profiles for each of your supporters is considered individual profile data. This provides your organization with context about each supporter's giving history, preferences, and motivations. The other metrics you measure in your Salesforce data management software generally depend on the activities of your nonprofit. If you need other metrics to best appeal to your donors or launch a vital project, save the information you need. Be wary of saving too much information. Make sure everything in your CRM is actionable to avoid overpaying for Salesforce storage. Data averages show the statistics that represent your supporter population as a whole. These are the metrics that are taken from the individual profiles, then combined to show you a larger picture of your nonprofit's fundraising and engagement opportunities. These metrics are determined from the reporting and dashboard features on your Salesforce CRM. Effective Salesforce data management stems from knowing which measurements to track to best grow and improve your organization. To obtain your individual metrics, you'll need access to effective fundraising software to integrate with your Salesforce platform. With an integrated software suite, you can streamline the data collected from your donation pages, peer-to-peer fundraising campaigns, surveys, and advocacy campaigns directly into your CRM. 2. Leverage your Salesforce donor management software to reach supporters. One of the major benefits of creating a complete software toolbox anchored to your CRM is that you can improve your marketing strategy with the functionality of your Salesforce donor management software. 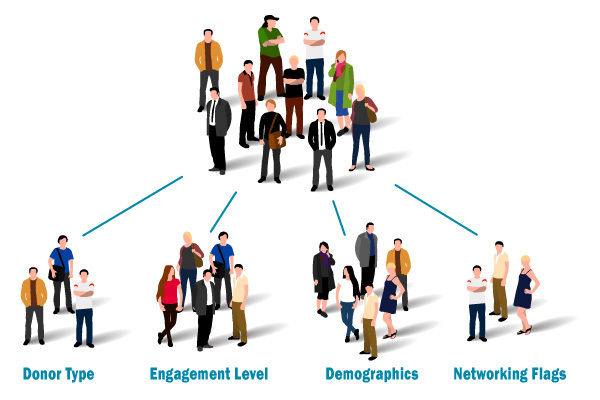 Using the metrics you've gathered from each of your donors, segment your supporters into groups. This helps enhance your marketing strategy by grouping donors according to their similarities and addressing those similarities for a stronger appeal. Donor type. Classify donors by type in your database. They may fall into categories such as a one-time donor, a recurring donor, or a major donor. Use these segments to better reengage one-time donors, steward major donors, etc. Engagement level. Segmenting donors by engagement level can help your nonprofit steward highly engaged supporters to continue building a relationship and further draw in those with lower or dropping engagement levels. Demographics. Segment donors by their age, gender, political party, and other demographic factors to better reach a population of supporters. For instance, you may push a peer-to-peer fundraising campaign for your younger, more tech-savvy supporters. Networking flags. The historic connections your nonprofit supporters have could be very valuable networking tools for your nonprofit. Segment donors based on their employers or where they went to college to better use these networks. Donors respond better to more personalized marketing. In fact, 55% of nonprofit donors claim that they would give or volunteer more in exchange for a more personalized experience with your nonprofit. Where does this personalized experience begin? By better understanding donor groups and marketing more effectively. It's difficult or impossible for donors to completely personalize every message they send to every supporter. That's why we rely on these donor segments to add a level of personalization without overworking your staff. 3. Manage all of your engagement opportunities in your Salesforce donor management software. It's helpful to think of Salesforce as a shell for your nonprofit's software solutions. When you start to customize your Salesforce CRM with top apps and integrations, you'll find it begins to meet your nonprofit's specific needs. One of these top needs for all nonprofits is a standard fundraising page. The first integration you'll probably look for to configure your Salesforce CRM is a robust fundraising software solution. But then you'll start thinking about advocacy, peer-to-peer fundraising, marketing, event registrations, and major gift cultivation tracking. When you use your CRM to house all of these engagement opportunities, you create a centralized location for more effective Salesforce donor management. Imagine you're hosting your annual fundraising event in your community to encourage adoptions for rescued puppies and kittens. It has always been successful, but you want this year to be better than ever! Add a peer-to-peer fundraising campaign leading up to the event to increase donation amounts. Incorporate an advocacy table at the event where supporters can click to call their legislator to support stricter laws against animal abuse. Promote the event on your Facebook and Twitter accounts. If each component of your campaign software is separate from all of the others, you'll need to switch platforms and screens to set up the registrations, fundraising campaigns, and advocacy landing pages. It can be difficult to know where to begin or how to prioritize and organize data. Plus, you'll want all of the information collected from each of these activities to be streamlined into your Salesforce donor management software. With the right apps and integrations, it's possible to do everything from your Salesforce interface. Planning events and campaigns from a single centralized location helps your nonprofit stay organized. 4. Integrate a fully-equipped toolbox with your Salesforce donor management solution. As we mentioned in the last section, working on a single interface to plan campaigns, events, and strategies helps your nonprofit stay organized. However, even within your Salesforce interface, you can better manage your data and campaigns with a fully equipped integrated toolbox. 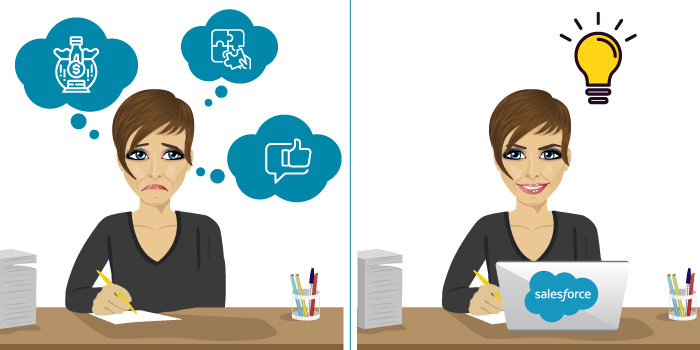 There are two routes you can take when it comes to customizing your Salesforce CRM. You can either add one-off apps to the system or integrate with a complete fundraising solution. We recommend investing in a complete fundraising solution to integrate with your CRM for the most effective Salesforce donor management. Nonprofits often require the same core activities when it comes to fundraising, advocacy, and outreach. A solution that does it all connects all of these functions to your CRM, but also work well with the other campaign features. Time. Instead of switching interfaces to find information about donors or campaigns, you can simply pull up your CRM. Plus, all of the data you collect is streamlined into your CRM and can be applied to any other campaigns. Finances. Purchasing one-off apps for every campaign and strategy your nonprofit needs can add up over time. Investing in a complete toolbox can actually save you money in the long-run. Data. It's important for different platforms to streamline data into your CRM, but when they all seamlessly work together as a unit, they'll also share data more effectively with one another. This creates a more cohesive nonprofit software unit. Too many nonprofits spend time and energy researching Salesforce apps that will only adhere to one specific function of their donor strategy (for instance, a single app for donation pages, another for advocacy, and so on and so forth). This is not only time-consuming to research but less effective in the long-run. Collect actionable data from your fundraising, advocacy, and other campaigns to store in your Salesforce CRM. Don't collect more than you need to save money on Salesforce storage space, but make sure you collect enough for your various strategies and campaigns. Segment your donors by the variables you collect to personalize marketing materials and push the right campaigns. Donors respond well to personalized messaging, so carefully consider your communication tactics for each supporter segment. Switching interfaces for different software strategies is time-consuming in itself. Centralize your campaigns in your Salesforce CRM to better organize campaign planning and data. Purchasing one-off apps to meet your nonprofit's needs is both pricey and time-consuming. Investing in a complete fundraising suite like Salsa Engage for Salesforce helps your nonprofit better manage time, money, and data. With these top strategies for effective Salesforce donor management, you're well on your way to customizing a software toolbox to help your nonprofit grow.